Cliffside at Sandcliff by the Sea is a beautiful, newly constructed, three story, 3 bedroom home overlooking Frenchman's Bay in Bar Harbor, Maine. Enjoy breathtaking views from balconies overlooking the ocean while surrounded by acres of lush pine, birch, and maple trees, with loads of fresh air to match. We're located just minutes from the entrance to Acadia National Park, and only 4 miles from downtown Bar Harbor. This Non-Smoking, vacation paradise home not only affords gracious accommodations, but also provides extras and amenities one would not expect to find in a vacation rental. At Sandcliff our goal is to provide our guests with the absolute best in accommodations and relaxation. 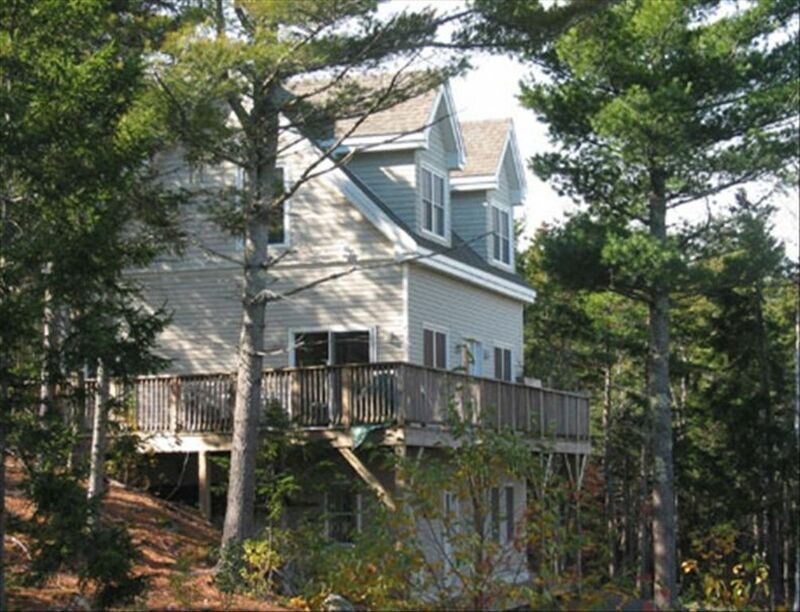 Sandcliff is nestled in on a quiet road with wildlife, woods, peaceful atmosphere, yet only four miles from the Downtown District of Bar Harbor,and only 1.5 miles to the entrance to Acadia National Park. This is a weekly rental only. Perfect for families. The first floor has a family room with specious living room, wetbar, and bath. Continue on to the second floor and enjoy living area, dining area, kitchen, and bath, and rest peaceful on the third floor that contains two more bedrooms. There is nothing more magical then Acadia National Park and Mount Desert Island. My homes are located on a very quiet road, with ocean view towards the North, and beautiful woods to the South. Wild blueberries grow all summer in the woods, and if you pay attention who will always spot a deer or two. We are close to the downtown area of Bar Harbor (4 miles), and exactly 1-1/2 mile to the entrance to Acadia National Park. Enjoy ocean views without paying for the price of ocean front! There is so much beauty of the island for you to enjoy when you return home you are in a traquiel setting of woods and ocean and privacy! main floor when we ate, visited, etc. The last day we saw turkey and three deer on the road by the house. All in all a great vacation! Glad you enjoyed out island and the fall season! Much less visitors, and much slower pace, but still a great place to viisit! Hope you enjoyed Cliffside! It is a three story home, as advertised, so I hope you enjoyed it, beyond the stairs to get to all three floors! It is a lovely spot, and glad that you enjoyed all the wild life that surrounds us all year! Hope you return! So glad that you enjoyed Cliffside! And freedom of having your dog close by and safe on the decks! Always happy when guests have a great experience here! Thank you Patricia: we are always pleased when our guests enjoy the property! We strive to keep the home is great condition, and love when our guests take care of it as their own! So glad that you enjoyed Cliffside and had such a wonderful time at the home and our lovely island! I am truly blessed to have so many wonderful guests that enjoy the amenities that Cliffside has to offer! Hope to see you return! My husband and I had been looking forward to this trip as soon as we booked it. One by one our grown children decided to join us, including our oldest son and his girlfriend. The house was big enough for all 6 of us. It had everything we needed for a comfortable and relaxing week. We made many trips into the center of town and enjoyed walking around and doing some shopping. We also hiked many of the trails in Acadia including Precipice trail on Mt. Champlain. Amazing! My oldest son also proposed to his girlfriend at the top of Cadillac Mountain at sunset. The pictures are breath taking. The house is in a great location and has everything you could want. I would stay there again anytime! Thanks for an amazing week! Oh Mary: What a wonderful story! So glad that your family got together and had such a great time at the house, and the proposal! You will ever forget your time here! So glad that you had such a wonderful time! Would love to see the family back again! Well kept, extremely clean, perfect location! Great space situated perfectly! The short drive to Bar Harbor is lovely, and being out of the tourist area is so peaceful. The house us well stocked with quality linens and kitchen necessities. We loved having meals and relaxing time on the wraparound deck, too. Clearly, the owner is in tune with her home and striving to keep it top notch. The beds were comfortable, the bar and rec area in the basement were great for rainy day entertaining. The balcony off the master bedroom had the best view! We spied wildlife daily, and the deer even had happy hour with us one night. We totally enjoyed Maine and would easily stay here if we were ever lucky enough to come back. So glad you enjoyed Cliffside! We love to hear that guests have enjoyed the peace and tranquility of the house! It's always a pleasure to know that guests have been comfortable and so enjoy the house! Would love to have you back! Minutes from downtown Bar Harbor, 1-1/2 miles from the entrance to Acadia National Park. Overlooks Frenchmans Bay.